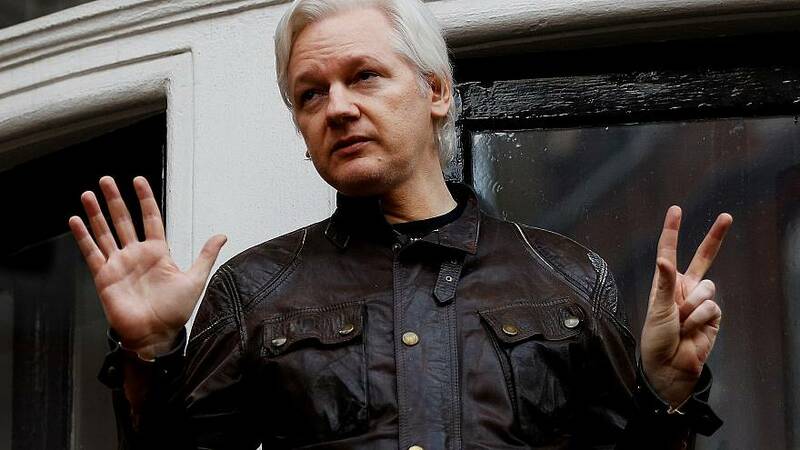 No decision has been made to expel Julian Assange from the Ecaudor's London embassy despite tweets from Wikileaks that he could be kicked out within "hours to days", according to a senior Ecuadorian official. In a tweet sent on Thursday, WikiLeaks claimed the Ecuadoarian state has an agreement with the UK for his arrest. Speaking to the Associated Press, the unnamed official has since denied the planned release of Assange. Ecuador's Ministry of Foreign Affairs said in a statement late on Friday that Assange and WikiLeaks had shown "ingratitude and disrespect" toward the country that has given him protection on its diplomatic soil by producing "rumours" that he would be handed over to British authorities. The pavement opposite was lined with more than 20 members of the world's media on Friday, many with TV cameras. A protest truck in support of Assage was briefly parked on Friday morning outside the embassy emblazoned with the words 'free speech, except war crimes'. On the scene for Euronews was Victoria Smith who went over to speak to the people who had parked their van right outside the embassy door, effectively blocking most media from seeing the denouement, should Assange have come out at that point. They didn't tell Victoria a great deal but we kept the camera rolling so you could hear the conversation, clink on the clip below. In a statement on Friday, the WikiLeaks legal team said expelling Assange would "violate international refugee law and be an attack on the U.N. which has repeatedly called for Assange to be able to walk free." "It will be a sad day for democracy if the UK and Ecuadorean governments are willing to act as accomplices to the Trump administration's determination to prosecute a publisher for publishing truthful information," said WikiLeaks. Sweden dropped the case in 2017 but Assange remains in the embassy following accusations of espionage. Back in 1995, Assange was let off with a fine and escaped prison for hacking attempts in Australia. He set up Wikileaks in 2006, protecting anonymous sources with highly encrypted devices. Ecuador last year posed new rules for Assange's behaviour while in the embassy, which required him to pay his medical bills and clean up after his pet cat. Assange didn't stepped out once from the embassy during his seven year stay, for fear of arrest by British police.